Produced by the endocrine glands, hormones are messengers that send signals to the rest of the body to control things like metabolism. Over time, the production of some hormones naturally decreases. Age-related changes are also linked in part to many conditions, including spinal disc degeneration. Research suggests women experiencing estrogen deficiency may have a greater chance of developing disc-related damage. However, hormone therapy may minimize this risk and prevent the need for minimally invasive spinal surgery. Beverly Hills spine surgeons discuss the crucial things you need to know about hormone therapy and spinal disc degeneration. A study of several thousand women and men found some interesting connections between hormones and disc degeneration. It’s notable for being the first study of its kind focusing on hormones and spine health where subjects in each of the groups were matched by age. All participants had their spinal disc height measured to identify possible signs of degeneration. Younger men in the study were more likely to have issues with disc degeneration than women within the same age group. Women who had already gone through menopause were more likely to develop issues with worn discs than men of the same age in the study. Such risks appear to be greater within the first 15 years of menopause, based on results of the study. Researchers observed that disc degeneration experienced during menopause is more severe in nature. They also stressed the need for additional studies to better understand the connection between menopause and spinal disc health. Because of the results of the study, researchers suggest postmenopausal women may be better candidates for hormone therapy. The treatment restores the body’s natural hormone balance, which could also help postmenopausal women reduce their risk of fractures that may occur within the joints or bones of the spine due to bone loss that occurs with age. Bones weakened by hormonal changes also increase susceptibility to various forms of arthritis. When spinal bones are weak, the odds of sustaining a fracture increase, which could cause a spinal disc to slip out of place and become damaged. A worn or damaged disc contributes to back pain or radiating nerve pain when nearby nerve roots are compressed. With hormone therapy for women, synthetic versions of the female hormones estrogen and progesterone are used. These medications may be delivered via an injection or with pills, patches, or suppositories. 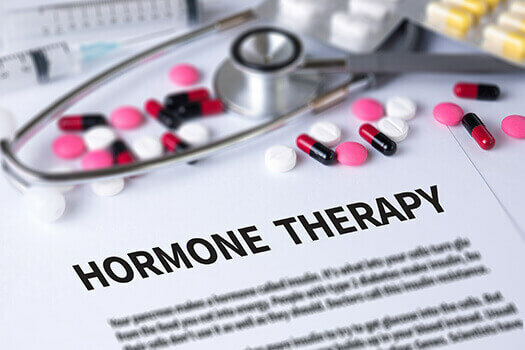 Hormone therapy involves testosterone replacement for men. This type of hormone treatment is already being used for pain management purposes for some forms of chronic pain in men, although there’s no significant research on male hormone therapy specifically for spinal disc degeneration. Making positive changes with diet and exercise also keeps the discs, joints, and muscles that support the spine healthy. Additionally, research suggests increased concentrations of the hormones estrogen and testosterone could relieve discomfort due to late-stage osteoarthritis, another condition that sometimes contributes to spine-related pain. If you think you might benefit from hormone therapy, talk to your doctor to see if it’s the right option for you. From fusion surgery to spinal cord stimulation, Beverly Hills patients have a variety of options for alleviating discomfort in the back or neck. Reach out to The Spine Institute Center at 310-828-7757 today to schedule an appointment and take the first steps toward living a pain-free life.